(NC) From turkey prep to the table settings, Thanksgiving can be a big undertaking for even the most experienced entertainer. To the rescue is lifestyle expert Pay Chen, who shares her tips on making holiday entertaining a breeze. Create a schedule. With multiple dishes to prep and heat, it’s easy to lose track of time. Use a schedule to ensure that you’re staying on track. Start at the meal itself and work backwards. And don’t forget that you want to give the turkey time to rest and be carved, so have the cooked turkey out of the oven an hour before you want everyone to sit down and eat. Set the table early in the week. Time flies on the big day and setting the table can sometimes be an afterthought. But according to Chen, the table sets the ambiance for the evening. Since there’s nothing time-sensitive about table setting, she suggests getting everything prepped and polished a few days in advance and letting it sit ready until guests arrive. Bonus? You’ll spot any unforeseen stains in your linens with plenty of time to have them cleaned. Outsource dessert.“The less time you spend in the kitchen, the more time you have to be with your family,” says Chen. “If you’re strapped for time, don’t be afraid to look for simple, pre-made solutions. 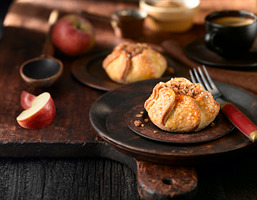 Store-bought doesn’t have to mean a compromise in quality.” For example, there’s a new collection of fresh-from-frozen treats from Chudleigh’s, an Ontario apple farm. Their scratch-made, single-serve Apple Blossoms can be reheated in the oven or microwave in minutes. Finish the plate with a small scoop of ice cream and enjoy some well-deserved rest at the end of the meal. Embrace the kids’ table. Thanksgiving is about bringing family together, but it doesn’t have to be about wrangling squirming kids into place for a long meal. A kids’ table is a welcome way to keep little ones entertained throughout dinner. “Cover the surface of a small table with kraft paper and set out crayons for kids to draw or play tic-tac-toe,” says Chen. The best part? Clean-up is a cinch. Prep for leftovers. Many people consider leftovers the best part of the meal, but not if you’re not prepared for them. Chen suggests cleaning out your fridge a few days before to free up space. And don’t be afraid to share the wealth. “Pick up a cheap and cheerful set of Tupperware that you can use to send leftovers home with your guests.” A parting gift of turkey and mashed potatoes? That’s something everyone will be thankful for. Find more information online at chudleighs.com.